Natural comb hives let me watch honey bees build comb like they do in the wild. The bees' amazing engineering skills can be seen in these hives. If I ever find bees in the wall of my house, maybe I can cut the wall open and add a window! 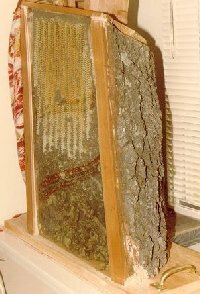 These photos show a simple half-log hive. 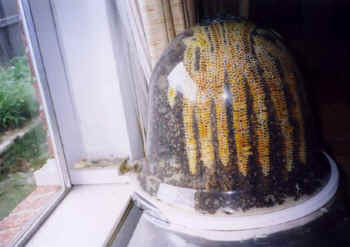 To start this colony, a swarm of bees were confined inside for several days and fed to encourage comb-building. The entrance to the outside is at the bottom of the hive. The front is made from acrylic window Plexiglas. Methods of feeding and medicating bees needed to be considered in the design of these hives, and many areas require a permit for non-movable comb hives. While natural-comb hives give plenty of insights on bee behavior, they do not give as much control as movable frame hives to inspect and replace comb. As this colony grew, a little comb-honey super was added on top! This idea came from some old beekeeping books that showed bell jars placed on top of a bee hive for honey storage. Here, I obtained a plastic bell from a garden supply store, and stocked it with a queen a about one pound (1/2 kg) of bees. The bees did the rest. This hive is designed for only a single season display. One highlight of this hive is that the queen laid eggs on some cells near the glass, so the developing larva can be observed. Some drone larva can be seen towards the bottom of a middle frame in this photo. This is rare! The entrance on this hive is detachable, so many different observation hives can be attached to this window entrance. 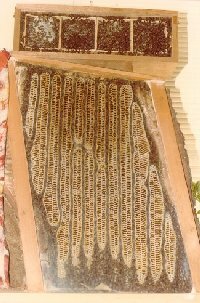 In 1991 I had the pleasure of working with Science Place Museum on an observation beehive project. Science Place Museum is located at Fair Park, Dallas, Texas and is visited by many children and their adult companions. We wanted a "natural look" to the hive to be consistent with the nature theme of the room and its other exhibits. 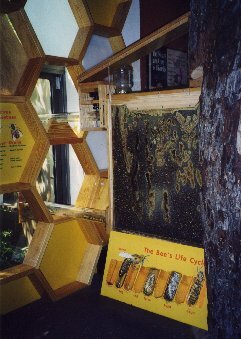 During the second year, the bees completely filled the hive with comb. The feeder jar can be seen at the top of the hive. After a few years, a close-up camera and video-viewer was added. It also has a microphone so people can hear the buzzing bees. A beautiful honeycomb window treatment has also been added! We built the top entrance because bees naturally head towards light when exiting the hive. The bottom entrance makes it easy for the bees to remove the dead and debris. Swarm control is difficult with this hive design, although we have successfully introduced new queens. I enjoy talking about the bees with visitors when I inspect this hive each month. Permanent or temporary - A permanent observation hive requires more attention than a regular bee hive. The bee population is likely to explode beyond the capacity of the hive in spring and summer, so the beekeeper may need to remove brood frames to weaken the colony. The hive may also need more feeding in times of dearth, since the bees may not have enough storage space for honey. Movable or natural comb - Movable comb is easier for management of colony size, disease and honey stores, but seeing the bees do their own thing in a natural hive is such a joy! Feeding and medicating capability - Unless the bees have enough space to store honey for the winter, they are likely to need more feeding than a regular hive. Moisture control & ventilation - If the hive is an indoor hive, it is best NOT to have any ventilation into the room. By using outside ventilation only, the bees will know more about the outside temperature and the hive will not have any "wind tunnel" effect created from air pressure differences. Location - Almost anywhere that is not in direct sun light will suit the bees nicely. A place allows for a very short entrance tube or direct access to the outdoors is best. It is not necessary to cover the hive to make it dark, except to make it easier for the bees to find the hive exit. The entrance - Bees tend to move towards light when leaving the hive, so access to the outside should be in the same direction as the strongest light. The exit is best placed at the END of the hive, to make it easy for the bees to find their way out. Exits can be from the top or bottom of the best lighted end of the hive, depending on design. An exit at the top end makes it easiest for the bees to find their way out, but an entrance at the bottom makes it easiest for the bees to clean debris from the hive. Entrances in the middle of the bottom can make it hard for bees to find their way outside. A very short entrance tube or direct access to the outdoors makes it easy for the bees to make many trips during good weather, and allows good air exchange so the bees become more aware of outside conditions. Avoid long entrance tubes, since these stress the bees. Cleaning - Capability to remove debris from the bottom of the hive is a nice feature to have, especially if location of hive entrance makes it hard for the bees to remove their dead. The bottom of the hive that uses a movable drawer "debris dungeon" concept will permit feeding of bees as well removal of debris. The glass will need replacement too, so I design hives that allow the glass or Plexiglas to be pried off and replaced. 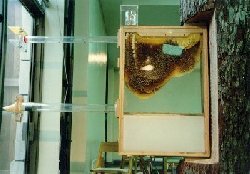 The simple "channel" concept for holding the glass is avoided, since the glass would be nearly impossible to remove after the bees have propolized it to the hive. Regardless of the design chosen, the bees will provide the entertainment! Observation hives have an interesting history, too.